My husband loves pie. I love to make pie. It's a marriage made in heaven! Seriously, I have enjoyed making pie since I was very small. 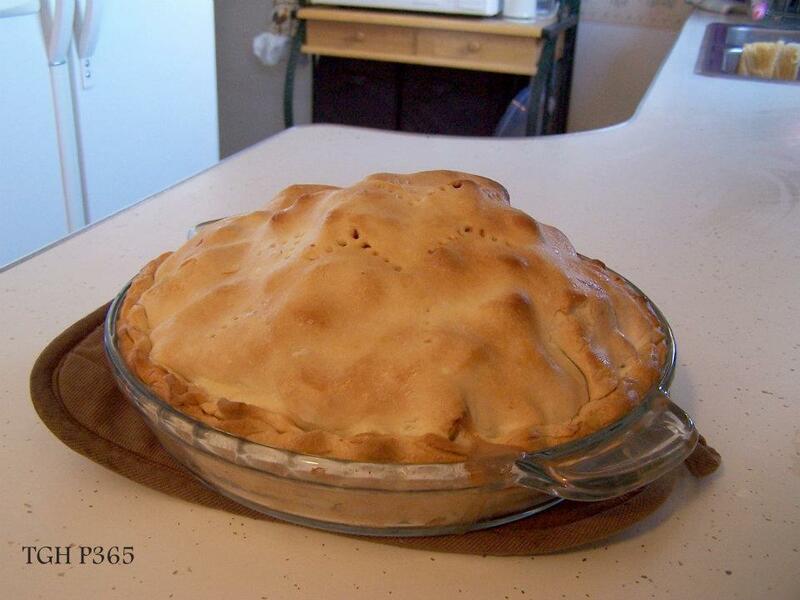 I gave my very first 4-H demonstration as a first year 4-Her on how to make good pie crust. I have mad skills making pie. My pie making has evolved over time. At first it was the basic Crisco pie crust recipe. I would calculate the amount of water the shortening would displace and measure the shortening in water to equal one cup. My mother was very smart, and in making it more like science and less like fussy measuring, it became fun for me. I used only ice water, and my grandmother's pastry cutter to make my crust, because that was the way Mom did it. These pies were mostly filled with store bought filling. I am not a fan of store bought filling. It seemed that the contents of one can were not near enough to make a sufficient pie. Also, the goop to fruit ratio was in the wrong proportion, favoring the goop and not the fruit. Once I was out on my own, I started making pie filling from scratch. I found it is easy to do. If I use canned fruit like cherries or blueberries or saskatoons (I have a tree in my yard), I make cooked filling. It is the same method I use to make gravy for savory dishes: Fruit and liquid, sugar, spices, and a couple big spoons of either corn starch or flour to thicken it. I like to add a splash of brandy, or other flavored liquor at the end after the fire is off. Remember, always cool your filling before putting it in the pie, otherwise your bottom crust will be soggy. Fresh fruit pies are easier still. Peeled and sliced fruit goes in a big bowl with a cup of sugar (or splenda) spices, and a couple big spoons of flour or cornstarch. Once it is piled up in the pie, I dot it with pieces of butter to make a custardy like thickener when it cooks with the fruit juice, and flour. Experts will tell you that you should cook your pie filling, so that when you bake it, you don't end up with hollow spaces from where the fruit cooks down in the oven. When I bake pie, I put absolutely as much raw filling in it as I can get. I get no complaints about hollows! I have experimented with different pie crust recipes, and like the ones with vinegar in them, or my mother in laws one that has a gillion different ingredients. I mostly just use the old Crisco recipe. I have it committed to memory, and don't have to fiddle with finding a recipe. There are just two things to remember when making crust: don't cut the shortening in too well, or you will lose out on all that flakiness, and always use really cold water and cold hands. It helps to chill the dough, but I am not patient enough for that, so it honestly never happens here. I still have good pie crust. I still use my grandma's old pastry cutter. It does the job, and I don't have to wash the food processor! I often use storebought pie crust anymore. It is a good product, and encourages frequency of pie baking, as I don't have a huge mess on the cupboard. That makes Don very happy! When picking ingredients to make pie, use your imagination! I had a fruit bowl full of apples and some ripe pears right at their prime. I also always have dried fruit of all kinds in my pantry that I can use. I chose dried cherries to add to my pie, but I could have used chopped apricots, or even cranberries, and they would have been delicious. To peel pears, scald them for 30 seconds in boiling water, and then plunge them in a cold water bath to cool. After all the fruit is peeled, add remaining ingredients and mix well. Taste, and add more sweetener if necessary. Pile filling in pie crust as high as you can get it, tucking fruit in here or there where there is a spot for it. Top with 2 T cut up butter. Put on top crust and moisten bottom crust with cold water. Pinch to seal. Poke top with a fork to make vent holes. I used to get in trouble if I decorated the top crust like my mother did. She considered it her signature. Too bad, Mom, I do it like you did still! Bake at 425*F until filling is hot and bubbly and crust is browned, about 1 hour. I always place a baking sheet below the pie to avoid cleaning my oven from overflow.